Inverse kinematics is a common topic in robotics control; one that most anyone working with a robotic arm needs to address at some point. The use case I’ll be looking at here is the situation where we want to specify an coordinate for the end-effector, and solve for the appropriate joint angle configuration that best achieves this. It’s surprisingly straightforward to handle with the right approach, so it’s a nice little exercise in Python optimization (and we’ll even work in some graphical display!) And per usual, the code is all up on my github. Most of the time the servos that anyone is working with are position controlled, meaning that you provide them with a set of desired angles for them to move to, rather than force controlled, where you provide them with a torque signal that directly moves them. In this case, inverse kinematics is all you need. You simply work out the set of joint angles you want the servos to move to and send those out directly. In biological systems this clearly isn’t the end of the work, because even if you know where you want to go you still have to provide a force (muscle activation) signal that will move your system there. But! as mentioned in the motor babbling paper review post I wrote a while back, having the target specified in the most basic space (i.e. joint angles instead of coordinates for a servo based arm, or muscle lengths instead of joint angles for a muscle based arm) can make calculating, or learning, the appropriate force signal much easier; so something that can do the inverse kinematics calculation is worth having. Now then, how do we go about finding the joint angle configuration that best achieves a desired coordinate? Constrained minimization! Our constraint is that the tip of the arm must be at the specified position, and we need to specify some cost function for the system to minimize to choose among all the possible configurations that accomplish this. The cost function that we’re going to use here is a very intuitive one, that I first encountered in the paper ‘Learning operational space control’ by Jan Peters. What we’re going to do is specify a default, or resting, joint state configuration, and minimize our distance from that. Which makes a lot of sense. I’m going to post the code for calculating the inverse kinematics of a 3-link arm, and then we’ll work through it. """Set up the basic parameters of the arm. All lists are in order [shoulder, elbow, wrist]. I’ve taken out most of the comments for compactness, but there are plenty in the code on github, don’t you worry. Alright, let’s take a look! First, we go through and set up the parameters of our arm. If nothing was passed in during construction, then we’re going to make an arm that is initially at it’s resting position, with shoulder and elbow joint angles = , and wrist angle = 0. We also set up the arm segment lengths to all be 1, and the minimum and maximum joint angles. 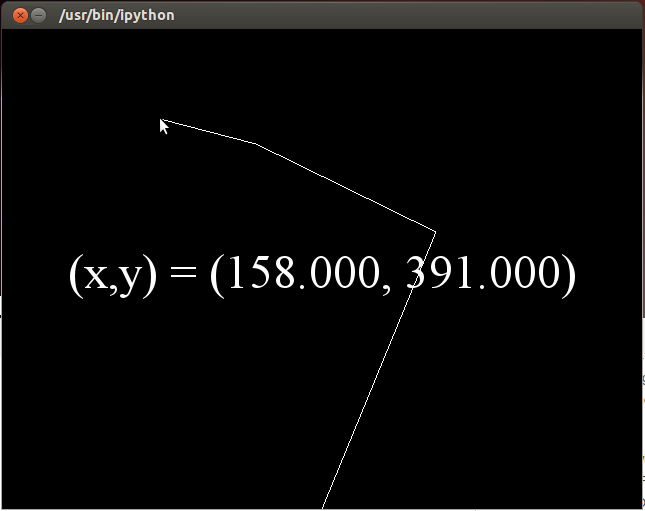 Next, there’s the get_xy function, which just uses some simple trig to calculate the current position of the end-effector. This is going to be a handy thing to have when we want to see how well the joint configurations we calculate achieve our desired hand position. And then after this, we have the actual inverse kinematics function. inv_kin takes in a desired position, and returns to us a list of the joint angles that will best achieve this. We define three methods inside inv_kin that define our constrained optimization problem, distance_to_default, which is the function we are minimizing, and x_constraint and y_constraint, which are the constraints that must be met for a solution to be valid. These are all pretty straight forward functions, the distance_to_default function calculates the Euclidean distance in joint space to the resting state, and the constraint functions calculate the difference between the actual and desired end-effector positions for a given set of joint angles. There is one point of interest in the distance_to_default method, and that is the use of the weights therein. What is the point of applying a gain to these values, you ask? Why, simply that it lets us weight the relative importance of each of these joints remaining close to their default configuration! If you think about moving your arm on a horizontal plane, the wrist actually bends very little. To mimic this we can set the weight applied to the distance of the wrist from its resting state higher than those of the other joints, so that it becomes a higher priority to keep the wrist near its resting state. I suggest playing around with once the graphical display (below) is built up, it’s fun to see the effects different weightings can give on joint configurations. With these three functions defined, we can now call up the scipy.optimize.fmin_slsqp function, which performs the sequential least squares method to arrive at a solution. So that’s all great and dandy, but it’s always nice to be able to really visualize these things, so I wrote another method that uses Pyglet to help visualize. This is a really easy to use graphics program that I tested out as a means here, and I was very happy with it. I ended up writing a method that pops up a window with a 3-link arm drawn on it, and the arm uses the above inverse kinematics function in the Arm class written above to calculate the appropriate joint angles for the arm to be at to follow the mouse. Once the joint angles are calculated, then their locations are also calculated, and the arm is drawn. Pleasingly, the inv_kin above is fast enough to work in real time, so it’s a kind of fun toy example. Again, I’ll show the code and then we’ll work through it below. finds the appropriate joint angles to reach that point.""" """This method finds the (x,y) coordinates of each joint"""
There are really only a few things that we’re doing in this method: We create an arm with somewhat normal segment lengths and a window for plotting; we have a function for calculating the coordinates of each of the joints for plotting; we have a function that tracks the position of the mouse and updates our arm joint angles by calling the arm.inv_kin function we wrote above; and lastly we plot it! Easy. The functions aren’t quite in that order, and that’s because I chose alphabetical ordering over conceptual. Here’s a picture! I think the only kind of weird thing going on in here is that my variables that I use in both this method and in the overwritten window methods are defined as belonging to window. Aside from that, it’s straightforward trig to calculate the joint angle Cartesian coordinates, and then there’s also a label that displays the mouse position for the hell of it. Honestly, the label was in a Pyglet tutorial example and I just left it in. It’s not going to win any awards for graphics by any means, but it’s simple and it works! And, assuming you have Pyglet installed (which is very easy to do), you should straight up be able to run it and be amazed. Or a little impressed. Or not, whatever. But in any case now you have your very own inverse kinematics example on a 3-link arm! Moving to any other number of joints is exactly the same, you just have to add the corresponding number of default joint configurations and everything should work out as is. From here, the plan is to look at bringing in an actual force driven arm model to the mix, and then building up a system that can track the mouse, but with a control signal that specifies forces to apply to the arm, rather than positions. Which I think will be pretty neat. And in case you missed it at the top, here’s a link to all the code on my github.